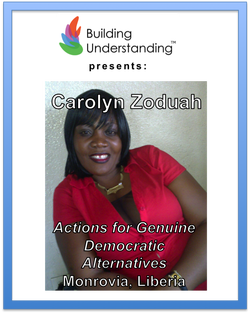 Ms. Carolyn Myers Zoduah works in Liberian media and civil society advancing women's rights and democracy. She is the Program Manager of Actions for Genuine Democratic Alternatives (AGENDA), a research and advocacy think tank organization working to promote transparency, accountability and citizens’ participation. Carolyn Myers Zoduah is a professional journalist with 10 years of experience working in Liberian media and civil society. In 2007 she conceived established the Liberia Women Democracy Radio, a project of Liberian Women Media Action Committee, supported by the United Nations Democracy Fund (UNDEF). She currently serves on the Press Union of Liberia's Intellectual Discourse Committee. and works as Program Manager of Actions for Genuine Democratic Alternatives (AGENDA) a research and advocacy think tank organization working to promote transparency, accountability and citizens’ participation. 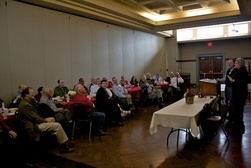 Currently, Ms. Myers Zoduah is a 2013 Community Solutions Program Fellow at the Siegel Institute for Leadership Ethics and Character at Kennesaw State University.